Tim Boening, owner of Petra Cast Stone, recently built and installed black, honed concrete countertops and a concrete fireplace surround in Grand Rapids, Mich., Spring Parade of Homes. The designer, Tylor Devereaux, whom he'd worked with before, had specified concrete because of its natural eco-friendly qualities. "The developer, Mosaic, of these homes is environmentally-conscious," says Boening. "They create developments that are smarter, optimizing land and design efficiencies that will continue to help the earth for years to come. They leave existing trees and native plants to preserve rainwater. For this job, they wanted a green product since they had used a lot of green materials on the site during construction. Since concrete is a renewable source, it fit with what they were trying to do." 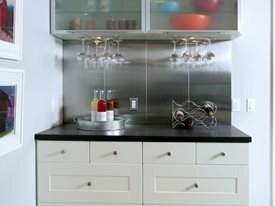 The designer specified black, honed countertops with slight aggregate showing. "They have a soapstone feel," says Boening. "We polished them up to 200. They have a matte-like finish." Boening makes his own concrete mix using recycled materials, such as slag, fly ash and silica fume. "This creates a denser product," he explains. "The denser you can get concrete, the less apt it is to stain. I also use a low VOC sealer to be as environmentally friendly as possible as well." The countertops were colored with a dry pigment called Iron Oxide Black from Prism pigments. "I make trial batches first to show the customer," says Boening. "They give me a range of color on a color sheet." Boening made five 6x6, 1" thick samples within the color range and the designer selected one. "I measure the ingredients down to the gram," he says so that it can be easily replicated for the final product. The countertops were pre-cast at 1 ½" thick. "They have a standard 3/8" rounded edge. 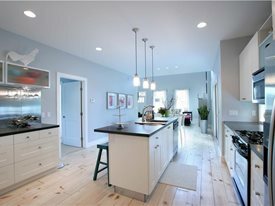 The island is 3 ½' wide by 8' long cast as one solid piece, with an undermount sink. We cast at the shop so we have better control over the environment," says Boening. 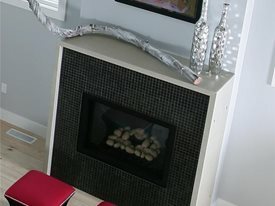 The fireplace, platinum in color, was created using a titanium white pigment. It's made in three pieces. There are two side panels with 45-degree angles which blend with 45-degree angles on the top horizontal piece. "We placed four stainless steel inserts on each side of the fireplace," says Boening, "giving the appearance of stainless steel rods holding it all together. "It is 18" deep, 5 ½' tall, 2" thick panels, 66" wide. Petra Cast Stone creates countertops, sinks, fireplace surrounds, mantels, hearths, and shower panels. "Our work is very refined," Boening says. "Extra care and time is taken when we create our products to get immaculate finishes. There's no pin-holing in our surfaces," he says. "We fill and grind so the finished product is like if you bought a granite slab."